DOBSON – James Edgar “Jim”, 61 – Jim passed away peacefully at his home in Pleasant River, Queens County, which he shared with his loving devoted wife of 37 years, Linda (Murphy) on May 28th, 2010. He was a son of the late George and Marion (Heslop) Dobson. In his youth he enjoyed scouts, bowling, hunting, fishing, hiking, rifle marksmanship and earned many trophies. Motorcycles were his first love to fix, ride and enjoy. Jim was a licensed car and heavy machinery mechanic. He worked for a logging company in Labrador and then at several garages in Nova Scotia. 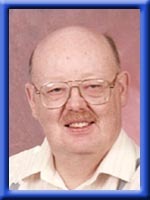 Due to a work injury ending his career as a mechanic, he retrained as a Stationery Engineer working for National Sea Products, Lunenburg until 1983 when he was laid off due to a diagnosis of Myotonic Muscular Dystrophy. When he was no longer able to work and, seeking more information regarding his disorder and what was done internationally, Linda visited university libraries and researched world-wide addresses regarding muscular dystrophy disorders. They sent thousands of letters and used the answers from world-wide Muscular Dystrophy researchers and organizations to write an unpublished manuscript. To accomplish this, Jim taught himself computer use. For the next twenty years, they published SMDI. INTERNATIONAL NEWSLETTER (a publication by and for those concerned with muscular dystrophy or the allied disorders) and ACCESS-ABLE INFORMATION (a quarterly disability information resource for helping people help themselves), till ended by ill health. They constantly fundraised and used all their own funds to offer free information internationally. Jim and Linda felt blessed in his hour of need to have the excellent care of Dr. Abriel and other members of the Palliative Care Team, and were grateful to VON Bertha Fiddes. Both were thankful for the Home Support workers. They appreciated e-mails from Dobson cousins and for friends who supported them: his lifetime friend Glenn and Linda Morris, Brenda Webb and sons Jonathan and Mark Roach, Bill and Gay Fancy, Edith Ficker, Linda’s (Murphy) family and many more. Cremation has taken place under the direction of Chandlers’ Funeral Service, Liverpool. A memorial reception for Jim will be held at Pleasant River Hall on Saturday, June 19, 2010 at 2:00 p.m.. All donations in Jim’s memory may be made to his wife as she plans to continue to assist others with neuromuscular disorders and disabilities. Online condolences may be made at www.chandlersfuneral.com. I’m sorry to hear of Jim’s passing. You’ve had such a journey ,shared in love ,over many years It was a privilege to have spent time with you and Jim ,and I miss seeing you. The plant cutting you gave me flurishes; and I think of you both fondly when I look at it enjoying the sunshine.Keep well as possible.I’ll see you on the 19th. Remembering the visit my late husband and I had to your cabin. Jim and Paul had a kindred spirit each knowing in their own way how to live and cope with myotonic Muscular Dystrophy. My love goes to you, Linda. The journey must continue. Memories are all we have. Yes, Linda, love hurts!! Very sorry to hear of Jim’s passing. You accomplished what you set out to do. There is a peace that comes with that. May that comfort you as you mourn him. Condolences. So sorry to hear about your husband, just know that we are thinking about you. If there is anything we can do please let us know. You are in our hearts and prayers. You are a wonderful gift not only to Jim but to our family. Thank you for all you have done and for being the devoted caring person you are. Jim couldn’t have had a more loving farewell. I wish you love, hope, peace, and the warm comfort of soft laughter and pleasant memories . . .
i heard he passed away. I’m so sorry to hear about Jim passing away. He was such a strong and loving person and you were allways by his side. You and Jim have done so much for others and so little can I do to comfort you in your sorrow. I send you all my love in your days of mourning.